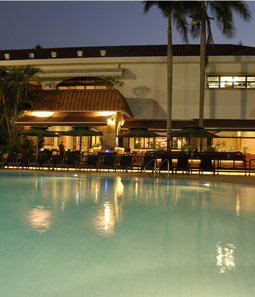 The Country Club at Hong Lok Yuen has been an exclusive resort oasis in a tranquil, green environment conveniently located between Tai Po and Fanling in the New Territories of Hong Kong for almost 30 years. The Club provides a wide range of sports & recreation facilities including swimming pools, tennis courts, squash courts, a comprehensive fitness centre, golf putting, petanque, table tennis, pool tables, and more, together with indoor and outdoor play areas for children. In addition, the Club also provides an excellent variety of Chinese and Western cuisines which make it an ideal venue for hosting formal and informal dinner gatherings. The Club is well equipped for corporate meetings, private parties, Chinese and Western wedding banquets, as well as provision for outside caterings for all occasions. Apart from these impressive facilities, full membership privileges include dining access at our sister club, The World Trade Centre Club, Hong Kong in Causeway Bay and the use of over 12 local and worldwide reciprocal clubs.